Charlie didn’t expect a five year old to have a good idea about how they were going to get their mother’s pearl necklace out of the big oak in the back yard. But he knew a hot air balloon was out of the question. “Where would we get one, first of all? Second of all, how would we get it here? Third of all…” But before he could finish with the third reason why it was a bad idea, Mary Faith started to sniffle. He didn’t want that to start again. He needed to think because not only was the necklace twenty feet above his head, it also happened to be dangling around the neck of Cuddles, their cat. Cuddles lay flat against a branch with her claws dug in deep. Despite the pleadings of Mary Faith, she hadn’t budged. Charlie was thinking as hard as he could when the back gate creaked. He turned to see his best friend, Ricky come through and slam it shut. “What’s going on? What are you guys looking at?” Ricky walked under the tree and looked up. Mary Faith needed a hug but Charlie wasn’t in the mood to give her one, especially with Ricky there. Ricky put his hands on his hips, leaned back and peered up through the branches. “I was supposed to be watching her,” Charlie grimaced. “No!” Charlie reached to grab Ricky’s arm, but before he could the stick ricocheted through the branches. Cuddles’ head darted back and forth and then she leapt up two more branches. “Oops. Sorry.” Ricky shrugged, picked up another stick and tossed it toward the fence. Just then, the gate opened, and Nate, Ricky’s older brother strode into the yard twirling a football. “What’s up guys?” He saw all their heads pointed up toward the tree. “Charlie’s little sis put their mom’s necklace on the cat and now the cat’s run up the tree and won’t come down,” Ricky explained. “Huh.” Nate gave the football another spin, leaned back and gazed up into the tree. “We could get the water hose out and zap her. That’d get her down,” Ricky pronounced. “No. Mom probably wouldn’t like it if her necklace got wet.” Charlie didn’t think Cuddles would like it, either. “That’s a good idea, Charlie. Isn’t that a good idea?” Mary Faith liked that idea much better than the water hose. “Yeah, I think so.” Sheesh, Charlie scolded himself, why hadn’t I thought of that. “Go in the house, Mary Faith, and get a can of food. Get her favorite.” Charlie’s little sister ran toward the house while Nate continued to take charge. “You need a ladder. 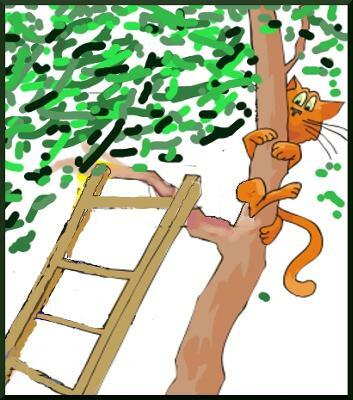 When the Larson’s cat went up a tree, they leaned a ladder up against it. That way the cat didn’t have to jump, she could just climb right down.” Nate walked his fingers across the air to demonstrate how easy it would be. Charlie didn’t like taking orders in his own backyard, but he liked the idea of his mom coming home to find her necklace up a tree even less. “Come on Rick, help me get the ladder.” He and Ricky hustled around to the garage, and when they got back, Mary Faith was holding out the can of food. “Okay. Hand it here.” Charlie pried open the lid. “Put a little on the top rung, get her interested in coming down,” Nate instructed. “Yeah, that sounds good.” Ricky dug his fingers into the can of food and smeared it on the top ladder rung, and then a bit more half way down. The boys propped the ladder against the tree, then the little group stood still and waited. A few minutes went by, Cuddles hadn’t budged. “Maybe we’re too close,” Charlie suggested. “Let’s back up a bit.” The four children moved to the edge of the back porch where they could watch Cuddles from out of sight. Several more minutes went by with Cuddles clinging as tightly to the branch as ever. “Well, I’m going home,” huffed Nate. “When you get tired of cat nabbing, we can play ball.” Nate spun his football in the air, caught it, and headed out the back gate. “Maybe you should try a different flavor,” Ricky suggested. “I don’t think that would matter.” Charlie was running out of time before his mom would be home and he’d have to explain what had happened. Charlie cringed. Cuddles liked birdies all right. Just last week he had chased her around the back yard until she let go of a terrified sparrow she had in her mouth. Charlie was starting to become annoyed at Ricky’s unhelpful suggestions when suddenly he grabbed Mary Faith by the shoulder. “Just hurry, go get it.” While Ricky went out the back gate Charlie went to get what birdseed they had from under the kitchen sink. He rushed to the back yard and spread it underneath the ladder. He was just emptying his bag when Ricky came back. “Here, spread it here.” Charlie pointed under the ladder where he had sprinkled the seed. “The whole thing?” Ricky asked. “Yeah, I’ll pay you back later.” Ricky added his partial bag to the ground. The three went back to their hiding spot by the porch. “I don’t get it Charlie. If Cuddles wouldn’t come down for cat food, she’s sure not going to come down for bird food,” Ricky whispered. In a few moments, a little white breasted junco fluttered down underneath the ladder and began to peck. In another moment, another one came. And then another and then another. Soon there were a dozen birds fluttering and pecking at the ground. “Oh, I get it,” nodded Ricky. Charlie looked up into the branches of the oak and saw Cuddles studying the birds below. She put out one paw. She hesitated, out came the second paw. She stood up, then step by careful step she worked her way down the tree and onto the ladder. One rung at a time she climbed down the ladder until at last she pounced down into the flock of birds. To Charlie’s relief, the birds darted away to safety. Cuddles made one more leap toward a straggler, then flicked up her tail and meandered over to the can of Salmon supreme. “Oh, Charlie.” Mary Faith clasped her hands together and started toward Cuddles. “Easy does it, Mary Faith.” She took his advice and tiptoed over to Cuddles. Mary Faith waited until Cuddles had finished her Salmon Supreme and was licking her paw before she bent over and picked her up. Charlie reached over and slid off the necklace. “Sure, when mom gets home.” Ricky gave Cuddles another scratch and then headed toward the back gate. “Did I have a good idea Charlie?” asked Mary Faith, “About the birdies?" “Yeah, it was a good idea.” Charlie took Cuddles from his little sister’s arms. “Now, take this and put it back where it’s supposed to be.” He put the necklace in her outstretched hands. “Okay, Charlie.” Mary Faith started toward the door then turned around and gave him a big squeeze. “Thank you, Charlie,” then she ran into the house. Now all Charlie had to worry about was how to explain the bird seed to his mom. He wondered if he could somehow leave out the part about the necklace. This should be in print. Great writing geared towards the right age. Kids like to read about other children solving problems on their own. It's entertaining and warm.